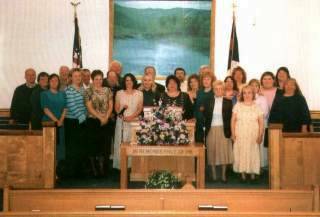 The Packs Branch Baptist Church Choir is under the direction of Brother Mark Davis and Crissy Edwards on the piano. The choir is made up of members from the congregation of the church who have a desire to praise and worship God in song. The choir meets once a week to practice. All practices begin with prayer. The choir sings at nearly every Sunday morning and Sunday night services. Many of the choir members also sing solo specials when called upon. Below are a few songs by our choir. The files are in mp3 format. Click on the appropriate link below to play the songs. If you want to download and save the files to your computer, follow these instructions. Choose "Save Target As" from the menu. Save the file to your desktop or where ever you choose. After download completes, double click the file to play. Click Here to see video of our choir.